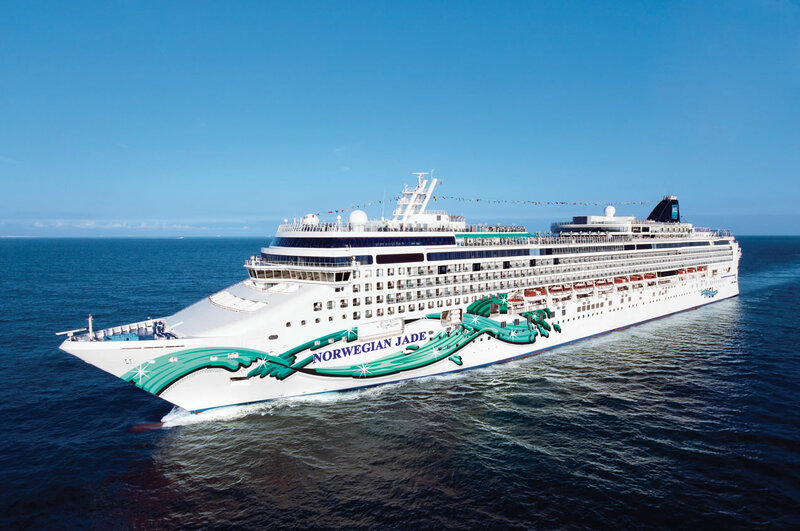 Norwegian Cruise Line’s Norwegian Jade will sail from Southampton in 2017, seven years after the cruise line last offered regular itineraries departing from the UK. Following a spell in dry-dock, Norwegian Jade will sail regular cruises from Southampton starting on 12 May 2017. A series of seven-night Western Europe itineraries calling at Hamburg, Amsterdam, Zeebrugge (for Brussels/Bruges) and Le Havre (for Paris) will be offered from 12 to 26 May and from 17 August to 21 September. A longer Western Europe itinerary of nine nights will depart on 28 September and 7 October with additional stops in St. Malo and Brest. Two nine-night cruises to the Norwegian Fjords will depart on 2 and 11 June with calls to Hamburg, Ålesund, Hellesylt, Geiranger, Flåm and Bergen. A 10-night Norwegian Fjords cruise on 7 August will also include a visit to the Orkney Islands. Norwegian Cruise Line has scheduled five ships – Norwegian Epic, Norwegian Getaway, Norwegian Jade, Norwegian Spirit, and Norwegian Star – to sail in European waters for the summer season in 2017. The recently refurbished Norwegian Epic will arrive in Barcelona on 14 April and will spend the summer season sailing seven-night ‘Western Mediterranean’ cruises calling at Naples (Pompeii), Civitavecchia (for Rome), Livorno (Florence/Pisa), Cannes and Marseille. In addition to Barcelona, guests can opt to embark in Civitavecchia or Marseille. Norwegian Getaway, the second newest ship in the cruise line’s fleet, will head back to Europe for the first time since its delivery in 2014. A series of eight- and nine-night ‘Baltic Capitals’ cruises will be offered sailing from Copenhagen between May and October, calling at Warnemünde (for Berlin), Tallinn, St. Petersburg, Helsinki and Stockholm. Norwegian Spirit will sail on alternating 11- and 10-night summer cruises in the Mediterranean between Venice and Barcelona. The 10-night cruises will call at Monte Carlo, Livorno (for Florence/Pisa), Civitavecchia (for Rome), Santorini, Kusadasi (for Ephesus), Piraeus (for Athens) and Split, and the 11-night cruises will call at Dubrovnik, Piraeus (for Athens), Kusadasi (for Ephesus), Santorini, Civitavecchia (for Rome), Livorno (Florence/Pisa) and Marseille. Between 16 April and 22 October Norwegian Star will call Venice her home for the summer. The ship will sail on alternating seven-night cruises to the Greek Isles and the Adriatic. ‘Greek Isles’ itineraries will see the ship call at Corfu, Santorini, Mykonos and Ravenna. Calls on the ‘Adriatic, Greece & Turkey’ itineraries are Dubrovnik, Piraeus (for Athens), Kusadasi (for Ephesus) and Katakolon (for Olympia). The new itineraries go on sale in mid-February 2016.